My new life has a cottagey feel – a rich bonanza, these current summer days of thunder and storm, lush views of the rain-drenched gardens this next morning, with more gray promise in the skies. Eyes on the trees all around me – pine, walnut, cottonwood – sensing the calm lake surface just beyond. These fresh days in my new life. Preceded by heat. Soaked into my bones heat filled days. Here at my desk, the roll-top with secret cubbyholes galore that I discovered unfinished at a flea market, wrestled home to a tiny living room years ago and stained myself, I am acutely aware of this new life and how I’m letting it in. Absorbing deeply at times, the vast changes I have gifted myself, all the while feeling the old vestiges yet uprooting, shaking off dirt, tiny pebbles clinging, reminders of what I held dear, just a few weeks ago. I find myself focused on forging ahead, most times out of joy, for the new beginning at hand, at times with a steely desire to NOT feel – weak longing, sadness, immersed in memory rather than adventures awaiting in present moment. It is all an intricate conglomerate, anyhow – perceptions, sensory input, choices – like this morning’s sun, shining through leaves of the sumac bushes outside my living room window. 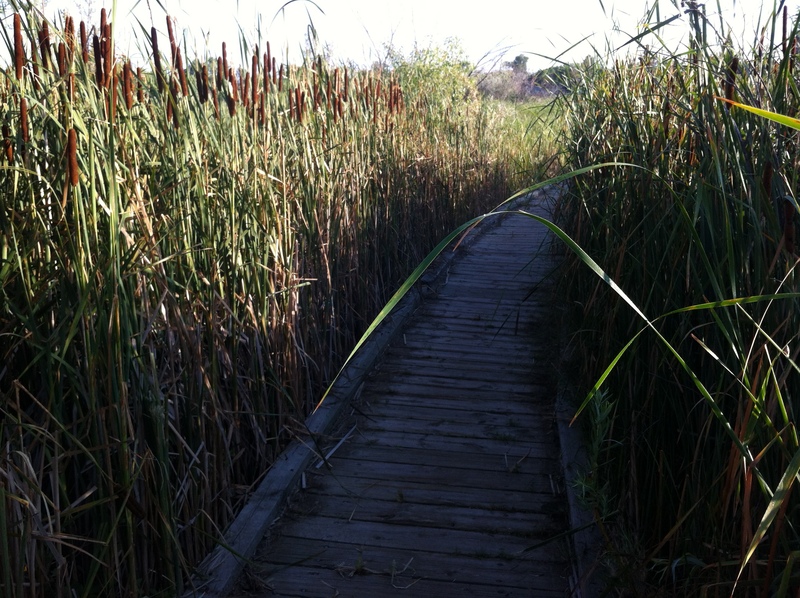 Like the head high cattails on the morning walk I took two days ago through the vast trails of open space here, east of the mountains. I was reminded of another chapter in my life, when I was 27, moving into a tiny log cabin in Meeker Park, Colorado, just off Highway 7 and across the road from the Meeker Park Lodge. I had electricity, but no running water. This I obtained in five gallon buckets, down at the Crystal Springs in Allenspark. I had no indoor plumbing, therefore, DID have a little path, through columbine and kinnickkinnick to the outhouse out back. I dug a small garden and planted cool weather vegetables at this high 9000 foot altitude: beets and carrots, spinach and radishes, potatoes and onions. Lettuce, I think. But the most memorable feature of the cabin was the grand wood cook stove, ornate, antique and functional. I bought what became a treasured volume: Woodstove Cookery, At Home on the Range, by Jane Cooper – now yellowed and stained, it is still in my cooking library to this day – with notes such as “snow tire bread” next to a recipe for yeasted wheat bread with cottage cheese and dill I perfected, and actually traded a guy at the Estes Park gas station for a set of snow tires for my truck. Those wild days, I also made a richly savory lentil stew I now call Meeker Mountain Lentil Soup. I was making the best of my life, as my husband and the cancer which overtook him at 30 years old, was making it’s engulfing path through his body – four states away from me and our 2 1/2 year old son. I was cooking 6 days a week – a chef at a French Continental restaurant in Estes Park. I heated water and bathed our son in a big aluminum washtub in the kitchen – he loved it, splashing and delighted, oblivious to the fact that my friends thought I was living in unnecessary hardship. Driven by a strength I hope to never be driven to again. At that time, living like a pioneer enriched and shot deeply through to my soul. Juxtaposed against my present life, I feel empathy for ALL who feel those primal urges to uproot, with that deep desire for change that wells up within us and propels us forward. As we listen, new chapters unfold like the sheets, blessedly clean, fragrant, cool sheets discovered in the late evening of moving day mayhem, unfurled gratefully over my newly made up bed in this house several weeks ago. Where I collapsed after the 19 and a 1/2 hour day in which one chapter of my life ended, and the present began. Last night, with the storm lashing and pummeling the ground outside my windows, as my friend upstairs and I texted excitedly back and forth about that LAST crack of lightning, and how Simon, the happy go lucky canine whose beaming smile greets me each time I see him, didn’t know WHOSE desk to hide under, I thought it a grand night for soup. After this string of 90 degree plus days, it felt almost exotic, cozy. I had a couple of canning jars of dried lentils in the pantry. I had half an onion. A red garnet yam, a handful of carrots. I had time – we weren’t going anywhere in this storm. I boiled the lentils, sautéed the chopped onion, the sliced carrots and the cubed yam in butter. 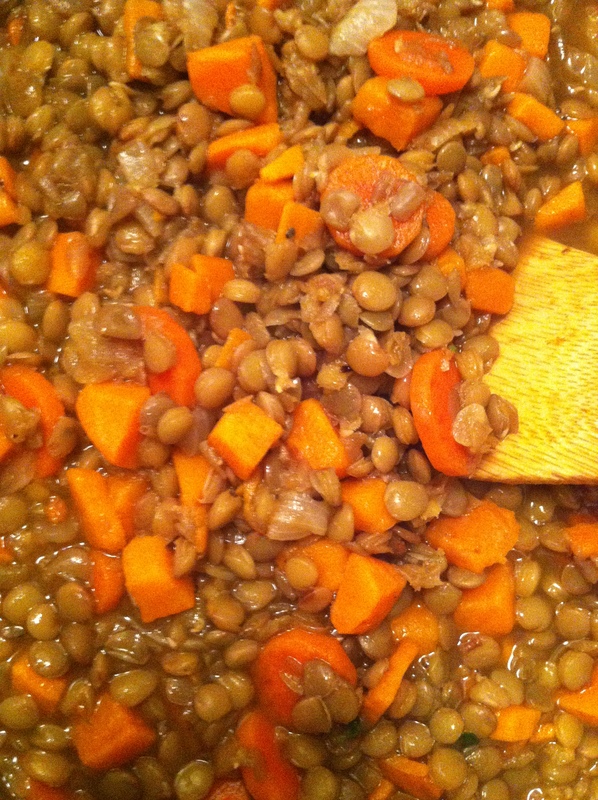 I added the softened, lightly browned vegetables to the lentils, with a little more water. This, my first time making lentil soup with yams instead of red potatoes, I had an inspirational hit. Freshly grated nutmeg – just a little, plus smoked paprika (from a spice shop in Telluride), and black pepper. A few shakes of salt. Then, with the thunder and lightning receding, I threw on a jacket and made a dash for the newly planted herbs I’d just placed in our shared garden space. 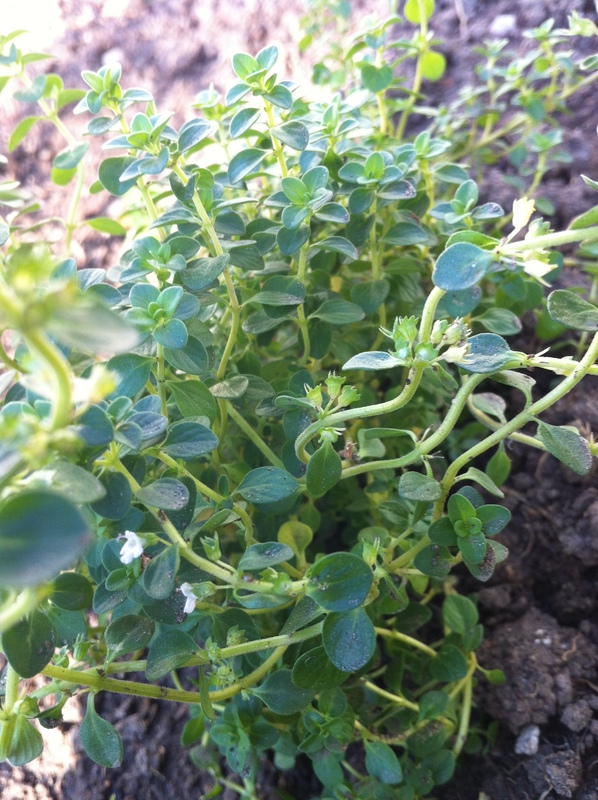 Plucked off a few wet, muddy stems of lemon thyme, and ran back to the house. I served up the soup with a spoonful of cultured sour cream, a slice of gluten free bread and butter. My days and nights and years all running together like the rivulets of rain making paths on the driveway. Branching out, then pooling. Soaking deep into my body. Pulled out in stories, in memories, and a recipe – one meal at a time.